The Logsdon Group and RE/MAX FIRST are privileged to offer at Auction Eagle Lake and Restaurant which was formerly known as Catfish Haven Pay Lake. This Property and Pay Lake has so much history and dates back to 1955. We are very excited that the Seller's selected our Auction Team to offer this Amazing Opportunity to own 31 Acres with a 7 Acre Lake and Restaurant on October 17th at Auction in Southwest Louisville! This property is currently known as Eagle Lake however it could be used for a number of different things and has in my opinion so much potential. 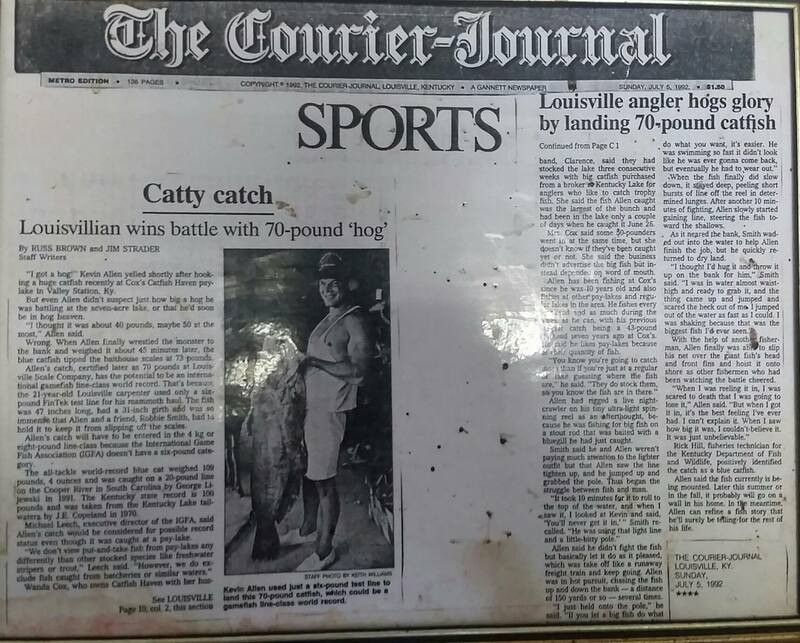 While taking some photos recently I found this framed article from the Courier Journal published July 5, 1992. Apparently the World's Largest Catfish at the time was caught on a 6lb test line by Kevin Allen at this lake. I'm not sure if this record still holds for a 6lb line but nevertheless PRETTY COOL!